We’d love your help. 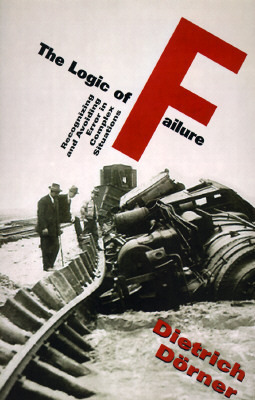 Let us know what’s wrong with this preview of The Logic of Failure by Dietrich Dörner. To ask other readers questions about The Logic of Failure, please sign up. The main gist of this book is that human beings don't always behave logically. This is entirely valid, but not very interesting to me. And anyway there are many other books on that topic. The attraction of this book was the promise of something that could help to deal with "complex situations." Unfortunately, the book is about computer simulations--NOT about "avoiding error" in the real world. It makes sense to rely on sims when it's not possible to study something in the real world, for example The main gist of this book is that human beings don't always behave logically. This is entirely valid, but not very interesting to me. And anyway there are many other books on that topic. The attraction of this book was the promise of something that could help to deal with "complex situations." Unfortunately, the book is about computer simulations--NOT about "avoiding error" in the real world. It makes sense to rely on sims when it's not possible to study something in the real world, for example with global warming. Otherwise, it's preferable to look at what has actually worked. If the author's games represented a good method for building skills in dealing with complex situations then he could test that prospectively in the real world. But he offers no evidence that playing these games leads to good relevant outcomes. Ultimately, the author of this book was just stringing a bunch of anecdotes together to try to prove that simulated gaming would be a good training method. I work with people who make a living at develooing and employing such games, and know how to actually use the scientific method, unlike this guy, who couldn't even bother to find ay scientific references for the poijnts he was trying to make. In addition, his basic attitude was that people fail becuse they arent't as smart as he is, although h Ultimately, the author of this book was just stringing a bunch of anecdotes together to try to prove that simulated gaming would be a good training method. I work with people who make a living at develooing and employing such games, and know how to actually use the scientific method, unlike this guy, who couldn't even bother to find ay scientific references for the poijnts he was trying to make. "[in relationship to good and bad planners] The good participants differed from the bad ones in that they tested their hypotheses. The bad participants failed to do this. For them, to propose a hypothesis was to understand reality; testing that hypothesis was unnecessary. Instead of generating hypotheses, they generated 'truths'." Or in other words, dangling truths unconnected from reality. The entire book is full of real world case studies and experiments showing how bad planning is the result of inadequate understanding of the interrelationships between complex systems, inability to visualize non-linear chains of causation and more importantly, the inadequate self-testing of the relationships between our mental models of reality and reality itself. Dorner also digs into the effects of exponential processes can have on system failures in terms of their speed and size (his best example is Chernobyl). These errors all come down to problems of cognition and the difficulty we face in imagining certain levels of complexity, and he provides a lot of advice into how to remedy them in planning stages, basically by asking the right questions and thinking in the right way. Highly recommend this to anyone interested in how systems fail, be it real world or in software. Dietrich Dörner is an authority on cognitive behavior and a psychology professor at the University of Bamberg, Germany. His research shows that our habits as problem solvers are typically counterproductive. Probably our main shortcoming is that we like to oversimplify problems. Dörner offers a long list of self-defeating behaviors, but common to all of them is our reluctance to see any problem is part of a whole system of interacting factors. Any problem is much more complex than we like to belie Dietrich Dörner is an authority on cognitive behavior and a psychology professor at the University of Bamberg, Germany. His research shows that our habits as problem solvers are typically counterproductive. Probably our main shortcoming is that we like to oversimplify problems. Dörner offers a long list of self-defeating behaviors, but common to all of them is our reluctance to see any problem is part of a whole system of interacting factors. Any problem is much more complex than we like to believe. And failure doesn't have to come from incompetence. The operators of the Chernobyl reactor, as Dörner points out, were "experts." And as experts, they ignored safety standards because they "knew what they were doing." 1. The slowness of our thinking-We streamline the process of problem solving to save time and energy. 2. Our wish to feel confident and competent in our problem solving abilities-We try to repeat past successes. 3. Our inability to absorb quickly and retain large amounts of information-We prefer unmoving mental models, which cannot capture a dynamic, ever-changing process. 4. Our tendency to focus on immediately pressing problems-We ignore the problems our solutions will create. Successful problem solving is so complex that there are no hard-and-fast rules that work all the time. The best take-away from the book (and this is my favorite quote): "An individual's reality model can be right or wrong, complete or incomplete. As a rule it will be both incomplete and wrong, and one would do well to keep that probability in mind." The book is 199 easy-to-read pages, and Dörner gives lots of interesting examples from lab tests illustrating people's actual behavior in problem-solving situations. I did not like this book. I am no academic, but I was appalled by the fact that the findings of this book are founded on such a small population of observations made in game-like scenarios. And then, to move from the specific to the generic, with broad strokes of the brush. A presumptuous book full of truisms. The one thing to take away from this book is that real-life systems are complex and not easily understood by humans. This is the best book I've read on the patterns common to all failures. It cuts to a very fundamental limit of our cognition and reasoning. When we build systems that challenge our perception or cognitive capacities, we are just asking for trouble. This is a book I always have on hand for reference. When Cass Sunstein call a book a classic (with similar praise from Tim Harford); it's definitely worth checking out. Until reading this book, I had no idea this type of thinking/analysis was a thing but now that I've the book, I can't believe I lived an existence without employing this type of analysis. The world is full of complex dynamic multi-variable interconnected problems that our brains systematically fail to comprehend. Through experience dealing with these systems (and reading this book!) When Cass Sunstein call a book a classic (with similar praise from Tim Harford); it's definitely worth checking out. The world is full of complex dynamic multi-variable interconnected problems that our brains systematically fail to comprehend. Through experience dealing with these systems (and reading this book! ), we can learn to overcome these heuristics. This should be required reading for anyone in charge of ANYTHING! Found out about this book while reading The 25 Sales Habits. "On s'engage partout, et puis l'on voit" - Napoleon, which roughly translates to "One jumps into the fray, then figures out what to do next." We live nonlinear lives. When you fill up your gas tank, drive 50 miles and the fuel gauge barely budges, then you drive another 50 and it plunges. That's a classic nonlinear relationship. The math is hard, we hate doing that kind of math and we kid ourselves into believing that we can generalize such relationships. We can't. All we can do is recognize that "On s'engage partout, et puis l'on voit" - Napoleon, which roughly translates to "One jumps into the fray, then figures out what to do next." We live nonlinear lives. When you fill up your gas tank, drive 50 miles and the fuel gauge barely budges, then you drive another 50 and it plunges. That's a classic nonlinear relationship. The math is hard, we hate doing that kind of math and we kid ourselves into believing that we can generalize such relationships. We can't. All we can do is recognize that complex situations are hard and assess them as they come and not try to predict the future. I really like this book in that he believes heavily in simulations and steers away from real world anecdotes. Failure has been a big part of my own life. It's really easy for me to look at my own life experiences and try to extrapolate out, unduly. For every complex situation, there is a solution that is clear, simple, but wrong. I think the most telling part of the book is when Dörner shows how humans by in large focus on as Donald Rumsfeld famously said "known-knowns" but we ignore the "known-unknowns". That inability for us to tackle problems that we know exist but are bad at dealing with can have cascading effects. I re-read this recently and it held up quite well.It is probably the closest thing to self-help, psychology or a business advice book I would read. I'm not getting soft or developing ambitions of business consulting; it is academic, analytical, and focuses on failures and fiascos. The subject is how poorly and predictably our intuition and thought patterns serves us in complex situations. In addition to real world situations (Chernobyl, for example) the author describes various laboratory experim I re-read this recently and it held up quite well.It is probably the closest thing to self-help, psychology or a business advice book I would read. I'm not getting soft or developing ambitions of business consulting; it is academic, analytical, and focuses on failures and fiascos. The subject is how poorly and predictably our intuition and thought patterns serves us in complex situations. Not what I expected. Rather than looking at real situations, this book looks at awesome videogame simulations of highly chaotic (in the mathematic sense) planning scenarios! Like playing discretized sim city, or playing 'balance the predators and prey'. The whole time they were describing how the good vs bad players played I was thinking 'come on, this basically seems like an IQ test'. Then they said that it didn't correlate at all with IQ, and talked about cool other rationality things. Like it Not what I expected. Rather than looking at real situations, this book looks at awesome videogame simulations of highly chaotic (in the mathematic sense) planning scenarios! Like playing discretized sim city, or playing 'balance the predators and prey'. The whole time they were describing how the good vs bad players played I was thinking 'come on, this basically seems like an IQ test'. Then they said that it didn't correlate at all with IQ, and talked about cool other rationality things. Like it's not coming up with ideas, but testing them. Not asking questions, but asking why questions. Then there were some boring parts and stuff about centralized category models being good and bad that I wish there was more of. Working with intriguing computer simulations of his own invention,Dorner exposes these flaws in our thinking. His examples-sometimes hilarious,sometimes horrifying-and brain-teasing thought experiments teach us how to solve complex problems.Awesome work for planning and decision making that bolster rational thinking skills of businessman or government officials or single mom.. The Logic of Failure is a popular translation of what appears to be some pretty hefty scholarly literature (I think-didn't bother to actually check 30 years of literature in German), that is hindered by becoming largely accepted wisdom. Dorner is a cognitive scientist who based this book on a series of studies of how people interacted with computer models: desertification in the Sahel, the economy and politics of a small town, predator and prey interactions. These studies, along with some exampl The Logic of Failure is a popular translation of what appears to be some pretty hefty scholarly literature (I think-didn't bother to actually check 30 years of literature in German), that is hindered by becoming largely accepted wisdom. Dorner is a cognitive scientist who based this book on a series of studies of how people interacted with computer models: desertification in the Sahel, the economy and politics of a small town, predator and prey interactions. These studies, along with some examples drawn from recent events like Chernobyl and military history, are used to explain failure a consequence of a lack of understanding of complex systems. Complex systems, interconnected networks with time-delays, buffering units, hidden keystone variables, and unclear indicators, are everywhere in the real world. Unfortunately, human minds tend to think linearly and concretely. Dorner documents several pathological thinking styles he encounters in his experiments. Some people over-correct, making dramatic changes while chasing a pointer that drowned out any data in induced oscillations. Some people get lost chasing irrelevant details, asking for more information rather than acting. And some people get trapped in methodism, following a predetermined course of action in complete disregard of the information coming in. Outstanding book; check out my comments for some great quotes and some of my thoughts. I gave this book five stars partly because I think decisions in complex situations are not explored enough and far too few people are paying sufficient attention to this problem. Most aren't even aware that that they are not aware of the problem. I also gave this book five stars because it makes the subject accessible beyond academia. "It seems likely that the capacity to tolerate uncertainty has something to do with how our participants behaved. When someone si I gave this book five stars partly because I think decisions in complex situations are not explored enough and far too few people are paying sufficient attention to this problem. Most aren't even aware that that they are not aware of the problem. "It seems likely that the capacity to tolerate uncertainty has something to do with how our participants behaved. When someone simply walks away from difficult problems or “solves” them by delegating them to others, when someone is all too ready to let new information distract him from the problem he is working on at the moment, when someone solves the problems she can solve rather than the ones she ought to solve, when someone is reluctant to reflect on his actions, it is hard to see in such behaviour a refusal to recognise one’s importance and helplessness and a tendency to seek refuge in certainty and security." "We find a tendency under time pressure, to apply overdoses of established measures. We find an inability to think in terms of nonlinear networks of causation rather than of chains of causation - an inability, that is, to properly assess the side effects and repercussions of one's behaviour. We find an inadequate understanding of exponential development, an inability to see that a process that develops exponentially will, once it has begun, race to its conclusion with incredible speed. These are all mistakes of cognition." The author highlights the problem where one goal negates another but the different people making localised goals in various departments in an organisation do not see either the dangers of compounding aggregate risk or that their individual gain is at the cost of another department's loss. The book recommends greater reflection and also to use more simulations so that we can practice our decision-making skills. I agree with this and will find ways of incorporating more simulations in my training programmes. It's a short, simple but important primer of a book. Dörner presents a good intro to decision-making in complex environments, however many of his recommendations could be shrugged off as common sense. Good problem solvers use clear goals (and intermediary goals) with accurate mental models which they refine over time. Poor problem solvers fail to account for conditions they want to leave unchanged, use less clear or precise language to express goals, and speak in absolutes. The only advice Dörner gives with which I disagree is his characterizatio Dörner presents a good intro to decision-making in complex environments, however many of his recommendations could be shrugged off as common sense. Good problem solvers use clear goals (and intermediary goals) with accurate mental models which they refine over time. Poor problem solvers fail to account for conditions they want to leave unchanged, use less clear or precise language to express goals, and speak in absolutes. The only advice Dörner gives with which I disagree is his characterization of planning as something you do before action. This works in simple closed systems when your mental model can theoretically account for the variables and interdependencies, but in truly complex systems, thinking by analogy is dangerous and most open systems require some level of action to 'perturbate' the system and generate an output from which you can refine your understanding. In other words, planning requires simultaneous action. I'm personally not a fan of the way Dorner derives his observations on planning. He admits up front that each of his test scenarios are simplistic and use an abnormally-small sample size from which no statistically-valid results could reasonably be extrapolated….and then does exactly that. In the end, it's a well written book which seeks to give concrete recommendations on how to avoid poor decision-making heuristics in complex systems, but I wouldn't try to build a course of instruction around it. - People have trouble understanding processes that work over time. People tend to respond to the situation, rather than to the process that produces the situation, leading them to overshoot or undershoot in their response. - Both good problem solvers and bad problem solvers develop hypotheses. But only good problem solvers bother to test them. - People often get sucked into solving the problems that are easy to solve, rather than the problems that are most important. Fascinating - the psychology of how we, as humans, fail and try to cope with these failures. The only reason not to give it 4 stars was that it is translated (very well) from German, so most of his references are to German language books, articles etc. He gives examples of problem solving situations and the responses of participants and then analyses why some did well and others fared poorly. Failures in complex situations (as are most of the problems in our larger world) are due to inability to Fascinating - the psychology of how we, as humans, fail and try to cope with these failures. The only reason not to give it 4 stars was that it is translated (very well) from German, so most of his references are to German language books, articles etc. Shallow most of the time. A large chunk of the book is about how systems change in time and respond to feedback, and how bad humans are handling it. In other words, control theory is hard to do by hand even in controlled situations. However, there isn't much theory, just some argumentation that humans can't associate past events with the current situation so they can't react properly. The final chapter has actionable advice to recognize situations that may lead to errors. Fantastic book, Expresses the logic of failure of decision. So many experimental facts but find very difficult in last chapter coz too many information and facts. I think the last chapter should have been distributed equally on previous chapters. So raw, made to read few time before closing the book. Thanks its a great voyage of decision making. This book was recommended to me by someone at work and I'm pretty glad he did. I don't usually read this genre, but the change of pace was refreshing. Especially when the book contains useful info that can be used in the real world. Some readers may think the writer adds to many examples towards the end of the book, but I believe he simply want to tie it all together. the author explore that most failure actually come from human ignorance. be it the scholar, college student or any ordinary people. Via deliberation & consciousness, the change of failure occurance may be diminished, not all lost all together though. still its a good read. “If we want to solve problems effectively...we must keep in mind not only many features but also the influences among them. Complexity is the label we will give to the existence of many interdependent variables in a given system. The more variables and the greater their interdependence, the greater the system's complexity. Great complexity places high demands on a planner's capacity to gather information, integrate findings, and design effective actions. The links between the variables oblige us to attend to a great many features simultaneously, and that, concomitantly, makes it impossible for us to undertake only one action in a complex system. A system of variables is "interrelated" if an action that affects or meant to affect one part of the system will also affect other parts of it. Interrelatedness guarantees that an action aimed at one variable will have side effects and long-term repercussions. A large number of variables will make it easy to overlook them. We might think of complexity could be regarded as an objective attribute of systems. We might even think we could assign a numerical value to it, making it, for instance, the product of the number of features times the number of interrelationships. If a system had ten variables and five links between them, then its "complexity quotient", measured in this way would be fifty. If there are no links, its complexity quotient would be zero. Such attempts to measure the complexity of a system have in fact been made.